Clipped from a magazine some time ago--Elle Decor? 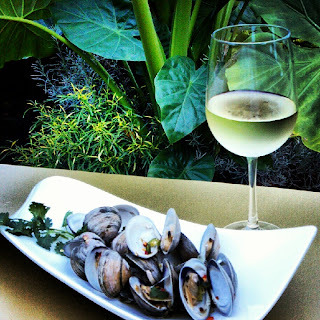 Martha Stewart Living?--this is such a clean, yet bracing and spicy way to serve littleneck clams. The hardest part is finding tender, fresh-caught clams--Whole Foods comes through regularly, as well as reputable fish markets. Paired with a chilled pinot grigio, some bread and a salad, it makes a late summer dinner on the terrace delightful. Dissolve 2 tablespoons salt in a large bowl of cold water. Add clams. Let soak at room temperature 10 minutes. Drain. Scrub clams under cold running water. Transfer to a large bowl of fresh cold water. Repeat, scrubbing clams and rinsing. Drain. Put reserved lemongrass leaves in a large pot with 1/2 inch of water. Bring to a boil. Add clams. Steam, covered, until clams open, three minutes or so. Drain and reserve clams in separate dish. Discard any unopened clams and the leaves. To the pot add oil, sliced lemongrass, shallots, garlic and chiles. Cook over medium-high heat, stirring constantly, until lemongrass and shallots turn golden, about a minute. Remove from heat. Add clams back to pot, gently stir to coat. Stir together lime juice and fish sauce in small bowl, expanding the amounts if you need to, and pour over clams. Transfer clams to a large serving bowl, sprinkle with cilantro. Garnish with lime wedges. Suggested soundtrack: Don Omar Tego Calderon "Bandolero"